Gene Nataan Royston Turquoise Bracelet size 7 1/8"
This bracelet by Navajo silversmith Gene Nataan is set with a thick round stone of natural, untreated Royston turquoise in a smooth bezel wrapped with twist wire. Gene used a variety of textured elements to decorate the cuff, including appliquées, starred buttons of varying sizes and raindrop wire which marks the equatorial center of the cuff. 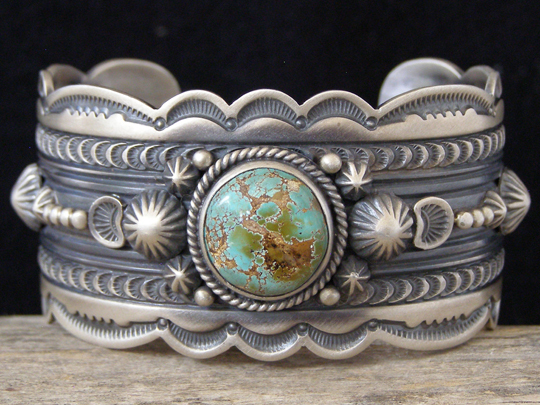 Gene's deep, impeccable stampwork adds another element of texture to this scalloped-edge cuff which shows an "old pawn" oxidized patina.